Red River Dave might be known as a Country singer, but he was really much more than that. 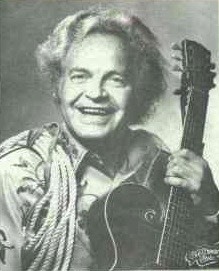 He was a folk singer in the true tale-telling folk-singing tradition. 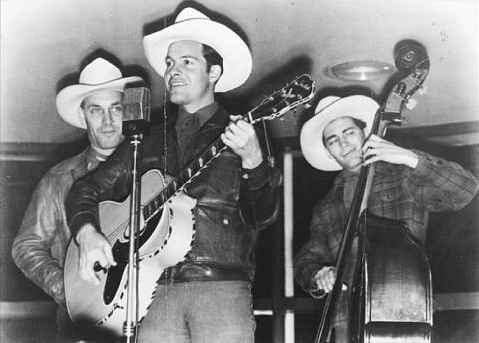 Many of his songs were narratives of current events, told in the Country fashion that was natural to him. Dave McEnery was born on 15 December, 1914, in San Antonio, Texas. He enjoyed singing Red River Valley when he was at high-school, and this earned him the nickname, Red River Dave. As a young man, he became a yodelling cowboy and a lasso twirler at rodeos. His big break, however, came in 1939, when he took part in a television broadcast from the New York World's Fair, singing one of his self-penned musical chronicles, Amelia Earhart's Last Flight. During the 1940s his height and good looks helped him to play the part of a singing cowboy in a number of Hollywood films. The 1950s saw him commenting musically more and more on the news events of the day, with stand-outs being The Ballad of Emmett Till, released in early 1956 on TNT 9005 and telling of the brutal murder of a young black boy in 1954, The Ballad of Marilyn Monroe, and The Flight of Apollo Eleven, though this is but a small selection. An interesting, if brief, newspaper article on Red River Dave’s career and song-writing skills can be found here. 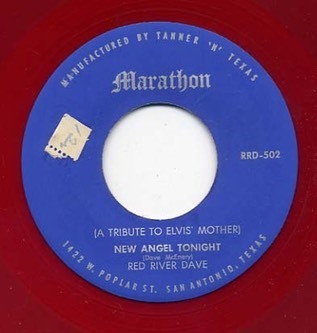 Of particular interest to fans of Elvis Presley might be his Marathon RRD-502 release, (A Tribute to Elvis' Mother) New Angel Tonight, probably recorded in 1958. Dave McEnery died on 15 January, 2002. Red River Dave states that he wrote the number, but that someone must have thought that the song was in the public domain and gave it to Flatt & Scruggs, who then recorded it for Columbia [in 1957]. McEnery's wife heard the Flatt & Scruggs recording and called it to his attention. He checked the record and saw that it had names other than his own credited as the writers of the song, so he contacted Columbia and they corrected the mistake. McEnery did not fault Flatt & Scruggs in the least. He also gave no indication about how he got the idea for the song, or how he wrote it. Dave's song first appeared in the 1940 song portfolio, Songs Of The Mountains And Plains (comp. C. Van Ness Clark; Rialto Music Publ. Corp., NY) (I Won't Care (A Hundred Years From Now) is included in No.6.). On 18 June 1940, country duo Bob Atcher and Bonnie Blue Eyes recorded a number with the title variously listed as I Won't Care (A Hundred Years From Now) and simply I Won't Care, which was first released on Okeh 05755 (August 1940) and later on Conqueror 9595 (January 1941) and Columbia 37751 (August 1947). I have it on authority of the Country Music Hall of Fame and Museum that this is the same song that was later recorded by Flatt & Scruggs. Furthermore, the Atcher-Bonnie Blue Eyes labels specifically credit "McEnery" as the songwriter. I listened to the Bob Atcher and Bonnie Blue Eyes recording of I Won't Care (A Hundred Years From Now), and it is definitely the same song that was later recorded by Flatt & Scruggs. I'm familiar with the Flatt & Scruggs version, and as you might expect, they took the song at a faster, driving tempo than the more lilting tempo of the Atcher-Bonnie Blue Eyes performance. I am not aware of an early recording of A Hundred Years From Now by Red River Dave himself, but he did eventually record the number in the 1960s (exact date unknown), and it was released as I Won’t Care (A Hundred Years From Now) on the LP The Singing, Yodeling Cowboy. No. 1 on Bluebonnet BL-119 in 1967. Sadly, I have not heard this recording.